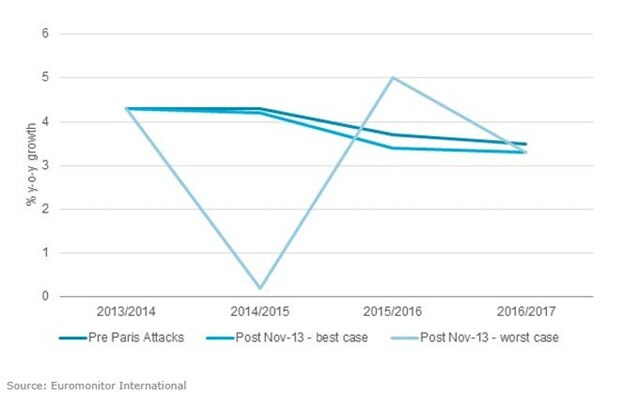 The outlook for travel and tourism demand in Paris is likely to be impacted in the short- to medium-term following the terrorist attacks on 13 November 2015 where 129 people lost their lives. Paris is the world's fifth largest city in terms of international arrivals. The latest arrivals data for Paris (15 million visitors in 2014) revealed that the city was already losing out to rival European competitors, such as London, Barcelona and Amsterdam, prior to the terrorist attacks, with a dip of 2% on 2013 due to a lack of competitiveness in terms of tourism product offer. Paris' largest source markets are the US and UK, which were already in decline before 13 November, and the worsening security situation will deter visitors, particularly from the US, who may choose other European destinations that are not under such a visible threat. Paris is also one of the world's leading luxury shopping destinations, and it was heavily affected by the sharp fall in Russian visitors in 2014/2015 due to the Ukraine crisis and Russian recession. Paris has a relatively large share of business travellers, accounting for 38% of international arrivals in 2014, and the corporate business segment is much more sensitive to security risks than the leisure segment. This high share of business tourists could potentially lead to a sharp fall in MICE visitors in the short-term, particularly as uncertainty over the political response and potential counter-attacks remain unclear and corporate business planners opt for alternative destinations. France may be the world's leading destination; however, Paris accounts for just 18% of France's total arrivals - 15 million vs 84 million in 2014 - so although there may be a slight slowdown in France as a whole in the next few months, Euromonitor International does not predict that the country will witness a decline in 2015 or 2016, as tourism is very much integrated into every region of the country and so will act as a shock absorber to the impact in the capital. In the wake of the attacks, and coming so soon after the Russian air crash in Egypt, there is heightened uncertainty about what the major repercussions of recent geopolitical events will be for the global travel industry. However, the travel industry was highly resilient following 9/11 and the various terrorist attacks seen in multiple countries over the past 15 years. Provided the necessary safety and security conditions are in place, advanced markets will continue to travel, and thanks to growth among the Asian middle classes, the travel industry is expected to continue on its upward trajectory, albeit at a slightly lower pace. The latest growth for global tourism demand, according to the UNWTO Barometer (October 2015 edition) is 4.3%, so it is likely that full-year growth will meet expectations and be the same as last year's 4.2%. The outlook for 2016 is less certain, so Euromonitor International estimates global growth in arrivals of 2-3% at a best case scenario. In a worst case scenario, the global travel industry may be looking at a similar performance in the years following 9/11, where there was a sharp drop in demand of over 4%, followed by a strong bounce back once the tightened security measures were implemented to reassure the travelling public and fight the global threat posed by Al-Qaeda. Following the Charlie Hebdo attacks in January 2015, the French government was swift to respond and reassure the public that safety and security were paramount. The Charlie Hebdo attacks did not lead to a decline in tourism demand in the first quarter of 2015; in fact, data from the UNWTO showed that growth was stronger for arrivals to France than in the previous year's quarter (2.9% in Q1 2015 vs 2.7% in Q1 2014). In addition to a coordinated political and military response to the latest atrocities by the French government, the travel industry and its stakeholders will now need to work together to ensure that crisis management systems are in place and also send a clear marketing message to the rest of the world that Paris is open for business. Paris should also work to find ways to drive leisure tourism in the short-term and promote the ideals that Paris and France stand for - liberté, egalité and fraternité. The sharing economy would be a good place to kick-start a campaign involving residents and visitors that shows solidarity. Following the Paris attacks, security at ports, airports, borders and at key cultural and historical attractions have been stepped up across Europe. The outlook for European tourism hinges on whether the authorities are able to contain the threat on the European mainland along with tackling ISIS at the source in the weeks and months ahead as the French government deploys military action in Syria. The state of emergency imposed by President Hollande in response to the terrorist attacks is initially set to last for 12 days, after that it requires to be passed by the French parliament, according to The Guardian. It is still too early to say whether the state of emergency will definitely be put in place for three months. However, this statement by Hollande sends a very strong message to ISIS and other would-be attackers that France will do what it takes to protect its citizens. The COP21 Sustainable Innovation Forum 2015 is due to take place at the Stade de France, one of the venues targeted by the group of terrorists, on 8 and 9 December 2015. Holding such a high-profile event in the city just weeks after the atrocities would be a highly effective way of demonstrating the will of the French people to not give into terror. Christina Figueres, executive secretary of the UN Framework Convention on Climate Change, has stated that COP21 will continue as planned.